Hurray for Alan covers! 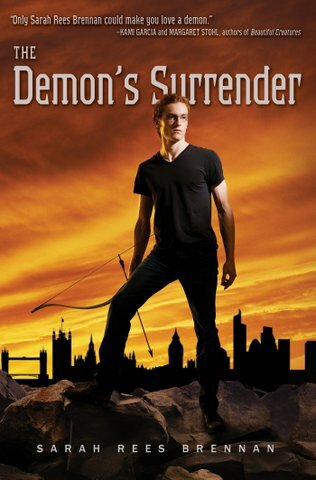 Sarah Rees Brennan just revealed the cover for the third and final book in her Demon's Lexicon Trilogy--The Demon's Surrender . And I say it's about time Alan got his own cover. Even if he is holding a bow (which is still awesome) and not his gun (which is Alan). But then I am an Alan Brigand if ever there was one, so I would say that, wouldn't I? This is the U.S. hardback cover and I'm anxious to see what the UK one will look like, as I've loved those covers immensely. What do you think? Who's your favorite character from the trilogy and what have you got your fingers crossed for in this conclusion to the series? You can read the first chapter over here. I love this cover, but i have a soft spot for my UK ones. I am hoping my love for this boy does not get dashed in this book and he is rewarded with the girl he most deserves, any by girl, i obvs mean Sin. It really is weird that he's holding a bow instead of a gun but maybe that's part of the story? Can't wait to see the UK cover because I like those editions better (even though my copies are US editions). I don't think he looks like I picture him. But still a cool cover. And I'm totally excited about this book! Total love. Not quite what I was expecting, but very definitely my favourite of the US covers. This is sort of Alan Revealed, isn't it? I also can't wait for the UK cover to be unveiled. It's definitely my favorite of the US covers. FWIW. In my minds eye Alan's glasses are a bit more nerdly. But I love the cover. As for my favorite character, sorry but it is Nick. He is just too much ;). I loved the second book in the series so much. High hopes for this one too! Not quite how I pictured him but yay indeed for Alan covers. I can't wait to see the UK version either. As to what I'm hoping for - Alan and Sin, Alan and Sin, Alan and Sin! Too much tension with those two! No, no, no I'm not liking this cover at all :( Nothing about it would have appaled me to pick it up in a store. LOL.. what a wonderful mistake I made. I meant appealed. I've got to get to this series. I'm always hearding how it's so great! Very cool! Alan's not quite how I pictured him, but the cover still works for me. I love Alan, and his relationship with Nick just gets to me! But, when all is said and done, Nick's my favorite guy, and Jamie comes in #2.